The play RIDE!, written by John Foster and directed by Charmaine K Parkin, is based on the murder of African-American James Byrd Jr. by three Klu Klux Klan members in 1998. 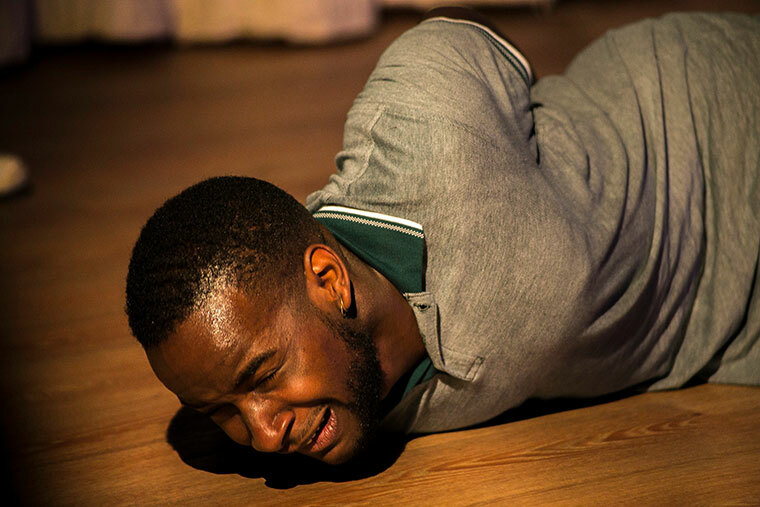 Playing the character of ‘Ethan’ based on James Bird Jr is actor Shaquille John, who stands in the centre of the stage as the audience enters. The only other performer is Ben Waller, who provides musical accompaniment and vocalises the roles of the murderers. The bareness of the production design acutely emphasises the focus on Ethan and the stark isolation of his situation. Over the course of the play, it is John’s task to carry the bulk of the narrative, and he rises to the task completely, turning in a powerful and controlled performance that keeps the audience with his character at each step. Vocally and physically, John embodies the gamut of Ethan’s emotions, beginning with suspicion as he is first approached by the three white supremacists who will kill him. This later transforms into confusion that rapidly spirals into terror, once Ethan realises what his monstrous fate is to be. John’s portrayal is electrifying, fearlessly using his voice and body to pull the audience into the horror that they are witnessing. The device of voiceover further illustrates Ethan’s explosive and increasingly fractured stream of consciousness, forcefully taking the audience into his interior world. Music, and particularly drums, serve to heighten awareness of Ethan’s situation, with credit going to Waller’s performance, maintaining a constant and sinister presence in the corner of the stage. John Foster’s sharply visceral writing, particularly the figurative language, gives the narrative a further dimension. Several precisely detailed images stand out, such as the description of body parts: ‘ivory fingers’, the eyes of KKK supporters as ‘steely magnetic’, and Ethan’s ‘writhing beneath fingers and nails’. There is room too for poignancy; a sunset is ‘like blush’ on the faces of the murderers, and Ethan describes his ‘little memories floating by the window’. The play’s abrupt ending brings to a close an unrelenting portrayal of one man’s final physical and psychological journey. Ethan’s last words are brutal in their simplicity and a chilling indictment of the social context against which this narrative occurred; his murderers acted as they did because ‘They had permission’. In today’s social and political climate, the issues of this play feel more relevant than ever.